A tropical adventure vacation in beautiful Belize had beckoned me from Instagram photos and Facebook feeds. “Come snorkel in my reefs,” it said. 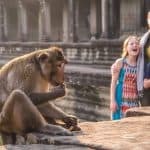 “Come climb my mountains, crawl through my caves, swim in my oceans, and explore my ancient ruins.” After procuring my first passport, my husband and I left the kids behind for a romantic escape. Except, when you have children, they are always creeping back into your mind. I found myself thinking that these wonders we were experiencing, the kids would enjoy too. I started to ask about age and height restrictions for different activities. I inquired with guides and other families and found that Belize offers adventures for all ages. Although this vacation was kid-free, I will be bringing the kids for some family fun in Belize next time. There is an ease in traveling through the country of Belize. Everywhere in Belize takes US currency at a simple $2 BZ to $1 US exchange rate. All the locals we met were friendly and helpful and since English is the official language of the country, there was no language barrier. 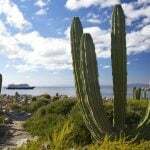 Most hotels offer airport transfers, although we chose to travel by rental car to explore the country at our own pace. The roads are easy to navigate even though, besides the highways, most are unpaved. Outside of Belize City, the only crime we worried about was petty theft. 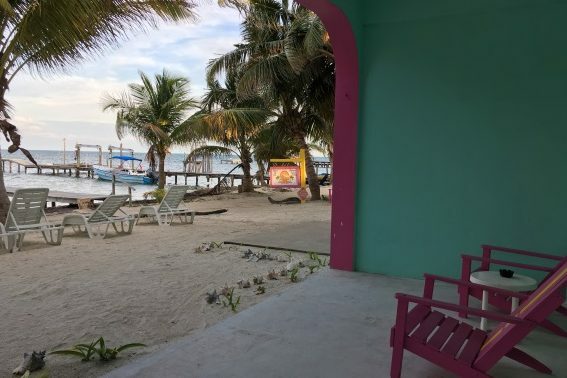 Stress melts away on the beautiful little island of Caye Caulker. It is easily accessible by a 45-minute water taxi ride from Belize City. The saying on this little island is ‘Go Slow’. Everything here is simple, from the sand paved streets to the wooden craft vendor stands. Staying on the south end of the island, a couple of minutes walk from the tour guides and shops in town, allows travelers to hear the ocean instead of shop vendors and tourists. We stayed at Barefoot Beach Belize, where families of up to four can stay in air-conditioned suites with full kitchens. There is also a private dock with hammocks to lounge on or swim off of. Each suite also includes two bikes for guests to use with the option to rent more (although there are no kid-sized bikes). All the accommodations here are fairly simple. If you are looking for big resorts with lots of amenities, go to Ambergris Caye. Although the island may have some simple features, there are many restaurant options all competing for tourist attention. Eating with the locals usually introduces some local flavor and often times can save some money. For breakfast, try the fry jacks at Errolyn’s House of Fry Jacks (located on the middle street across from the bank). Meldy’s (also on the middle street) is a great place to eat for gigantic portions of delicious local fare. Be prepared to wait a while for your food…most restaurants here really take the “Go Slow” saying to heart. 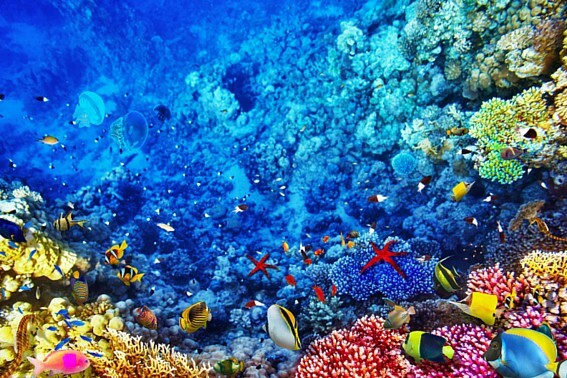 The Great Mayan Reef, the second largest reef in the world, is waiting just offshore to be explored. 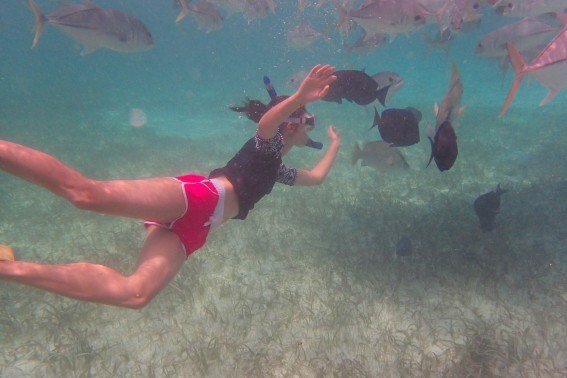 Caveman Snorkeling Tours offers full & half day snorkel trips that are great for families. There are no age restrictions and no swimming ability is required. Tour groups are organized based on ability, so a group with kids won’t be placed with a group tour of young couples. If you want to play on the beach, stay in Hopkins. 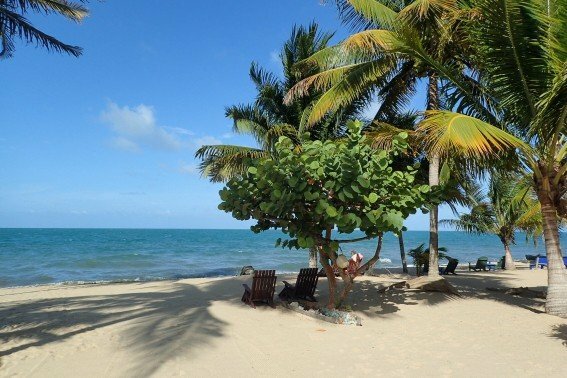 This traditional Garifuna fishing village provides miles of beautiful coastline leading into the warm Caribbean Sea. Our hotel in town didn’t cater to families, but their sister property next door, AJ Palms, looked to be a great choice when traveling with kids. The owners rake the beach every morning so the sand is clean and inviting. Being in the village gives a unique insight into another culture. If you prefer a quieter stay, Hopkins Bay Resort is located just north of the village and offers fun packages for families. Local Garifuna dishes, like Hudut, are a unique treat for seafood lovers. Eat with the locals at Tina’s Kitchen. The menu is written on the wall of this open air restaurant. Tina cooks all her food in a kitchen visible from the tables, so you can see all the love she puts into her meals. Another great option is Innies Restaurant, located on the south end of Hopkins Village. Marva has been cooking up Garifuna and Belizean favorites here for over 20 years. Hopkins is located just 30 minutes away from Mayflower Bocawina National Park. Arrive early to beat the crowds and tour groups. We were the first ones in the park and didn’t see anyone else on the Antelope Falls Trail until our way down. It was amazing having the pool at the top to ourselves! This trail would be best for older kids (10 and up) who aren’t afraid of a challenge as it consists of many steep stairs and tricky navigating. The rewarding view and amazing pool under a waterfall at the top is worth the climb. If traveling with smaller ones, you can still enjoy the novelty of swimming under a waterfall at the Lower Bocawina Falls after taking a flat, mile-long hike. 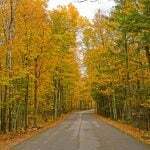 About an hour from Hopkins is Cockscomb Basin Wildlife Sanctuary. Rent tubes here and take the family for a relaxing 45-minute float down the river. We saw a family with kids around 6 and 8-years-old taking a break from their float and splashing around one of the sandy banks. 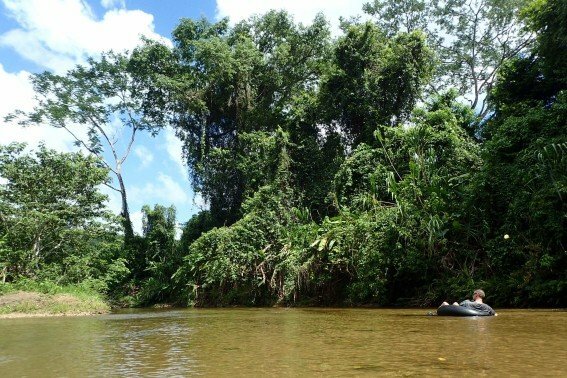 At the tubing exit, there is a 20 minute trail to another of Belize’s beautiful waterfalls. Although we didn’t stay long in either Belize City or Belmopan, there are a couple of places worth checking out. Belize is full of wildlife, but most of it will remain unseen in the wild. That’s why a stop at the Belize Zoo may be worth your time. Get up close to toucans, jaguars, tapirs, and other local animals. For an additional fee, hold and feed some of these creatures. The animals are all rescues and well cared for by the knowledgeable staff. 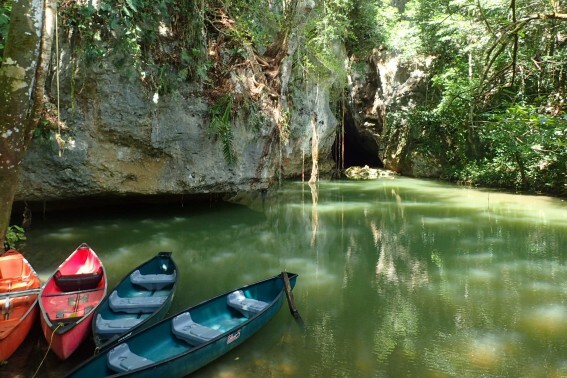 About 30 minutes south of Belmopan on the beautiful Hummingbird Highway is St. Herman’s Cave. A short trail here leads to a cave that families can explore without a guide. If you don’t have flashlights, you can rent them from the visitors center. There are steps and a clear trail so it is easy for kids to manage. 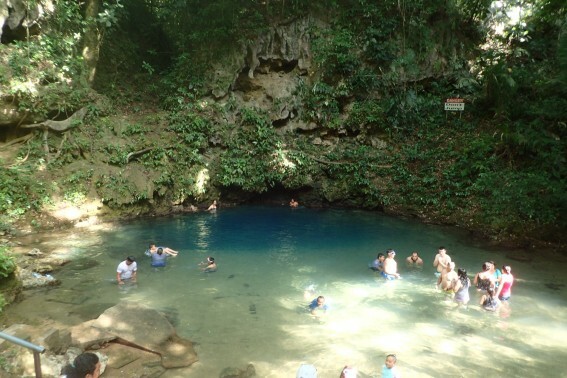 After hiking, take the kids just down the road to St. Herman’s Blue Hole and cool off in a sapphire blue, water-filled sinkhole. The water has a large, shallow, sandy area before dropping off to a maximum depth of 25 feet. We swam here on a Sunday and shared the swimming hole with many of the locals. Adventure calls from every corner of San Ignacio. If I had to choose one location to stay in Belize, it would be this town. San Ignacio is surrounded by rainforests, rivers, and ruins. The town is much larger than the other villages we stayed in, but offers a melting pot of cultures and cuisines. 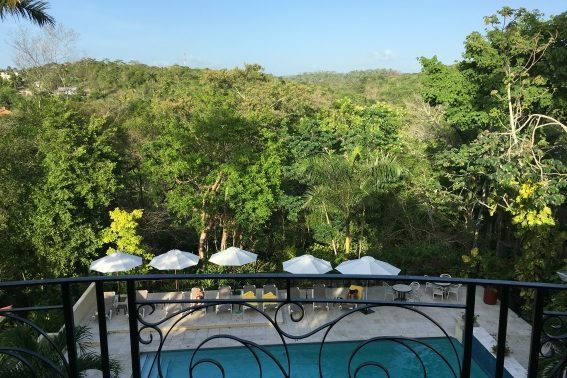 We stayed at the beautiful San Ignacio Resort Hotel and I can’t imagine a better place to stay. The location is right on the edge of town, close enough to walk but far enough away to be peaceful. This Belizean-owned boutique hotel gives each guest the VIP treatment, with a welcome drink upon arrival (rum punch or fruit punch), a chilled peppermint towel (quite refreshing after the humid heat), and a quick tour of the grounds. Families should consider staying in the Garden Rooms. These rooms have a private patio with lounge chairs and a hammock leading to a semi-private garden. This garden is only accessible through the garden rooms so kids can run and play without escaping. The hotel will soon open two premium suites available for families that will feature bedrooms, jacuzzi tubs, and a million-dollar view of the lush rainforest that borders the resort. After a day of adventuring, families can lounge in the pool or enjoy a relaxing game of tennis. San Ignacio Resort Hotel houses one of the best restaurants in town, The Running W Steakhouse & Restaurant. The meats all come from the local family-owned ranch, The Running W. I was nervous that ordering steak be too American, but the pea soup, vegetable rice, and local seasoning gave the food a nice Belizean twist. I also suggest trying the refreshing sorrel juice. Dine outside to experience more of the million-dollar view. A simpler, yet still tasty dining option is Ko-Ox Han Nah in town. They offer a wide variety of menu options including a kids menu that features hot dogs and french fries. Excursions here can be found in all directions. 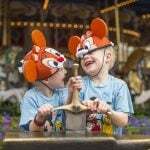 Although some experiences would be tough with kids, there are many family-friendly options. Right at the San Ignacio Resort Hotel is the Green Iguana Conservation Project. A knowledgeable guide teaches visitors all about the iguanas as guests pet, hold, and feed them. Our guide told us about other local plants and animals as well, and he even had us try eating termites from a large nest along the trail (they taste like carrots). If you need a break from the heat, head up to the Pine Mountain Ridge and swim in one of the sparkling jade pools beneath Big Rock Falls. There is a somewhat steep trail to hike down to get to the water, but manageable for most kids. We saw a few families here wading in the water and diving from the cliffs. Belize has an extensive cave system, many of which were used by the ancient Mayans for sacrifices. All of the cave tours require a minimum height of 40 inches. I would suggest the canoe tour at Barton Cave Creek for families. This tour has the same information and some similar artifacts to the Actun Tunichil Muknal (ATM) caves, without the physical exertion. Kids will enjoy swimming in the beautiful pool near the cave opening. Adventurous family members can also try the on-site zipline here. The nearby Mayan ruins are conducive to family travel. Xunantunich is only about 20 minutes out of town and features an informative visitors center, which makes it a good choice if traveling without a guide. Get here early to beat the crowds and see the iguanas exploring the ruins with you. 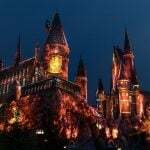 San Ignacio Resort Hotel can organize any transportation or excursion for your family with their local licensed tour guides. They also offer in-room babysitting, so you can leave the little ones behind if you want to try a more adventurous outing. Another great company for excursions is MayaWalk Tours. We used them for our ATM Cave tour and were very impressed with their knowledge and service. There is so much to explore in Belize! Which Belizean adventure are you dying to try? For help planning your own family trip to Belize, check out TravelBelize.org. It’s a great resource for travelers looking to learn more about the country. Disclosure: The author was an invited guest of San Ignacio Hotel. All opinions are her own.